Librarian Lindsay Norris feels that books back in the library for recirculation are worth the loss of any fines collected, and she organizes Briar Creek Public Library’s first overdue book amnesty day. The flood of books is so overwhelming that Lindsay not only recruits her entire staff, but also the group of crafternoon ladies who come to the library weekly to craft, discuss books, and enjoy a lunch together. A copy of J.D. Salinger’s The Catcher in the Rye wins the prize of the most overdue book at almost 10 years, but what is more shocking is that the person who checked it out was Candice Whitley, a local high school English teacher who was murdered. The plot thickens when Lindsay and the staff realize that the book was checked out on the very day her body was discovered and that the killer was never found. Always curious and possessed with a natural inclination to want to find the answers, Lindsay uses her research skills to look into this cold case. The case may be cold, but it seems that the memories of the horror of Candice’s murder and the secrets contained are warming up and Lindsay finds her researching skills put her in the hot seat. This is the seventh book in this delightful cozy series. 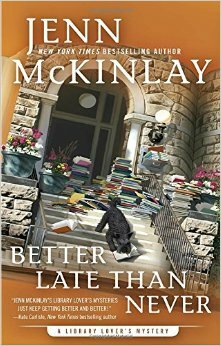 Jenn McKinlay writes three cozy series – the Library Lovers, the Hat Shop, and the Cupcake Bakery – and they all embody what makes a cozy mystery so enjoyable: a fun protagonist, likeable characters, a fun setting, and plot that is interesting without being too complex. Of the three series, I enjoy the Library Lovers the most; a combination of the library setting and book references interests me, and the book is also set on the Connecticut coast with several adventures on the open water. Lindsay is a very likeable character and her rationale for research and curiosity are very believable. The author weaves in a bit of romance with two gentlemen vying for Lindsay’s attention. These books are perfect for the carpool lane or waiting in the doctor’s office. Each time a new one comes out, I feel like I am visiting with an old friend. Make sure that you read them in order! This entry was posted in Book Series and tagged Better Late Than Never, Connecticut, cozy mystery, Cupcake bakery mysteries, J. D. Salinger, Jenn McKinlay, Library, Library Lovers, The Catcher in the Rye, the Hat Shop on November 8, 2016 by kvgaughan.